Vitriol-filled and immensely sarcastic, the misanthropic comedy Seinfeld finally gets a much-awaited DVD release today. 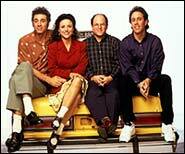 A show about four alarmingly likeable characters, Seinfeld has often been critically rated among television's best written shows ever, and TV Guide actually proclaimed it the best television series of all time. Relatable occurrences thread together, randomly interwohen with extremely believable life situations, which is what set this series apart. Unusual characters, however, helped the cause to a great extent: vanilla, paranoid, supermodel-dating, clean-freak Jerry; high energy, intemperate, frank Elaine; loser and pathological liar George. Not to forget, of course, who would become the series' greatest draw: inimitable, idiosyncratic wacko Cosmo Kramer. Here now are the series' first two seasons, lovingly poured onto DVD, after much cast-and crew debate. And the results have been reviewed as nothing short of spectacular: with commentaries by the entire cast and writers Jerry Seinfeld and Larry David, special featurettes, trivia sections, and much more. Plus, the special gift set includes salt and pepper shakers from 'Monk's Diner', a regular feature of the show, and the crucial backdrop to many a bizarre conversation between Jerry and George. President of Sony Pictures Home Entertainment, Benjamin Feingold, claims Seinfeld is the first television DVD release to get a full-fledged 'event marketing' campaign behind it, on the same scale as the studio is giving its other marquee title, Spider-Man 2, one of the year's biggest movies, out on November 30. Yada yada yada, as Elaine would simply say. Based firmly in the frightening world of four selfish protagonists, Seinfeld was NBC's massive post-Cheers success. Industry insiders claim Jerry Seinfeld was offered more than $110 million (as star/writer) to continue into a 10th season and beyond. Resultantly, leaving the show while on top ensured the series never endured, well, a 'shrinkage' in popularity. The DVD set is expected to establish new records. Hype has ensured that all 400,000 deluxe gift sets have sold out a week in advance, even though the set, at $120, burns quite a hole in the pocket. During its eight-year run, Seinfeld was nominated for 58 Emmys and won 10, including outstanding comedy and writing for a comedy series. Anticipated by insiders to sell more than 3 million units, it now seems slated to become the best-selling television DVD of all time. Yanking demands will be further seasons hitting the shelves every six months, each with more promised bonus material. Going up, to accompany the sudden return to the presses, is also the nostalgia factor. Online sites have been adding polls to determine which of the series' moments was the most memorable. Laughably pleasant, this is a tremendous task, with moments like The Marine Biologist, The Butter Shave, 'shrinkage', The Race, The Puffy Shirt, and the unforgettable Soup Nazi to choose from. Despite the obvious difficulties, America Online's poll led to a landslide in favour of The Contest, where the gang decide to withhold pleasure; characteristically, they bet on the odds, and George cheats to win!